I bought some live rock yesterday - had quite a deep hollow in one side - I thought there were some mushrooms in there but couldn't really see as they were all shriveled when out of the water. 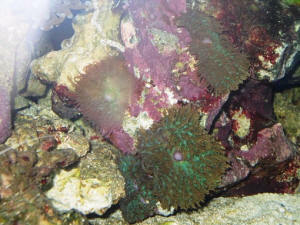 I put the lr into a holding tank and this morning have found 4 anemones? have moved out of the hollow onto the front. They are all at least 1inch x 1 inch - the tentacles extend less than 1cm - they are quite flat, almost like a mushroom. I have had a look at the ID pages and couldn't see much resembling them. I wondered whether you could ID them for me and suggest whether its a good idea to keep them or not. I have a 500l tank with a 100l sump, 3 x 54w T5s with reflectors (soon to be 4). Lots of soft corals. I have attached a picture and hope I have given you enough information. Thank you for time and your reply. 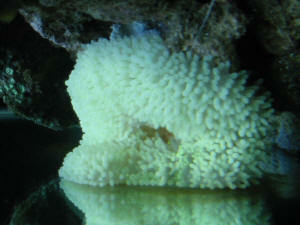 I have tried to do some research about the Sun Anemone and can't find too much. Am a little concerned as the information I found states that they will eat small fish (I have a couple of very small fish such as a yellow goby, neon goby, clowns) - does this mean they aren't safe to keep in the tank? Also some of the other information says that they have a very powerful sting - this has confused me a little because my shrimps often walk over them / stand on them and don't react as if they have been stung. I suppose I just really want some reassurance that my fish will be safe with them rather than me needing to give them away - what are your thoughts? <I would trade them to someone with a biotopic TWA shallow water habitat.